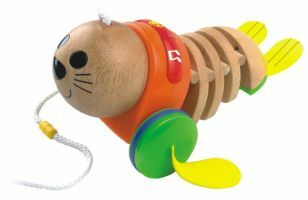 With his innovative construction of PVC plastic and shaped wooden parts, Flappy the Seal moves like a real seal does. Pull him along, watch him hop, and listen to the fun sounds and music he makes! Or hit the 3 buttons on his back to hear the sounds whenever you like.